Grab some tissues, your favorite fattening comfort food snack, snuggle into something comfy, and get ready for a great movie! 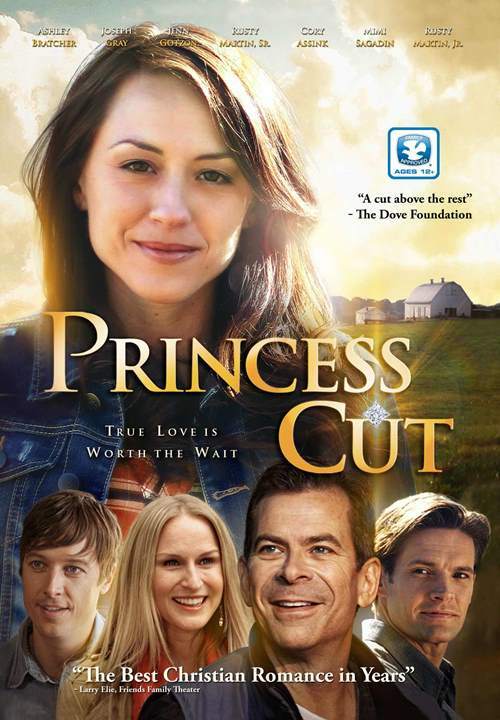 Watchman Pictures was kind enough to send the review crew a copy of their movie, Princess Cut, and I LOVED IT! Princess Cut is about a young woman named Grace (Ashley Bratcher) who wants love. Not just any kind of love, but true, God sent love. Ashley is a sweet, loving gal who is loyal to her parents, and loves God. She wants to live a pure, God centered life in all aspects-Including her relationships. She'd been involved in a long distance relationship with Stewart, who went off to college and came back a completely different person. Grace was heartbroken over this, and shortly after she met Jared. Jared made her feel special, and loved, but something was right. She didn't FEEL right, and Jared pushed her to do things that she just didn't feel were right and just. She confessed these things to her parents, and her dad told her it was his job to prepare her for marriage and protect her until that time came. He used soy beans as an example, and told her she was trying to reap a harvest before planting the seeds. He suggested she find out who God wanted her to be, and wait and let God bring love to her instead of her looking for love. Grace devoted herself to studying various books to really find out what she wanted in a relationship, and what God wanted for her. A young man named Clint moved in at the neighboring farm. Clint recently graduated medical school, and accepted a position in East Bend, the small farming community where Grace lives. Clint and Grace's family become friends, and Clint helps her dad a lot. Clint goes to Grace's parents and asks their blessing in exploring a relationship with Grace. He wishes to have a relationship that will result in marriage, and he wants to get to the know Grace, under their guidance, better so that they can both decide if they should marry. This is all great, until Brooke comes along. Brooke is Clint's ex-girlfriend from college. Brooke and Jared conspire together to try and throw a wrench into God's plan, but a well aimed sling shot saves the day! You'll have to watch the movie to see how it all ends. I loved the overall movie. I loved the story line, plot, and the underlying messages of forgiveness, patience, and purity. Being a photographer myself, I was a little put off by some lighting and filter choices, finding the white balance of some scenes was a tad too yellow for my taste. I also raised an eye brow a time or two over a few chosen camera angles that I think could have been shot differently to achieve a better appearance and feel. With that aside, the overall movie is really lovely and touching. It is child appropriate, which I love. Even though purity is discussed, sexual notions are not. There is a scene where Grace confides in her parents that Jared touched her hair and kissed her, and wouldn't stop, and she didn't like it. And another scene where Grace is talking with a therapist and tells her she didn't like it with Jared touched her. But, there is no mention or even hint of a sexual act beyond kissing. To be honest, the movie could be a great teaching tool to teach purity, strength of conviction, and also that no means no. Overall, I would highly recommend this to others, and I can't wait to share this with others in my family! Please check out the Homeschool Review Crew to see what others have had to say!